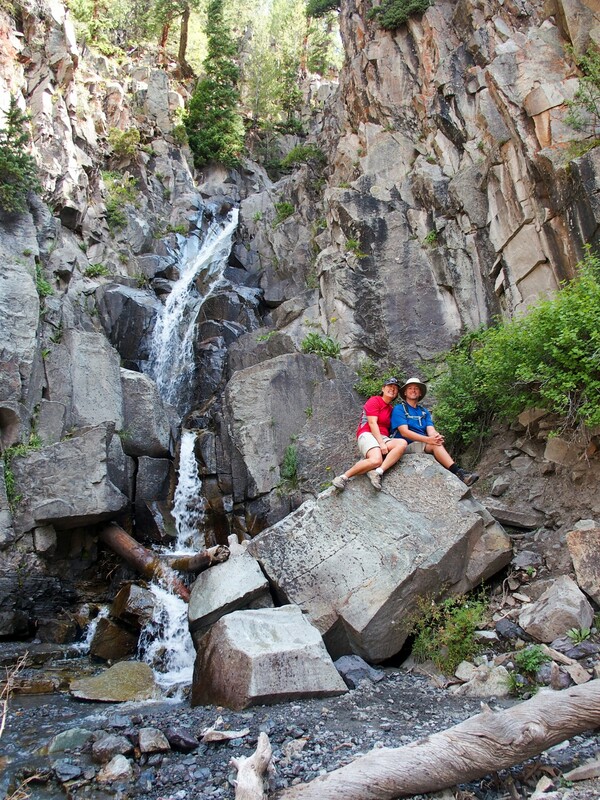 Life Rebooted – Ouray, the fun part! 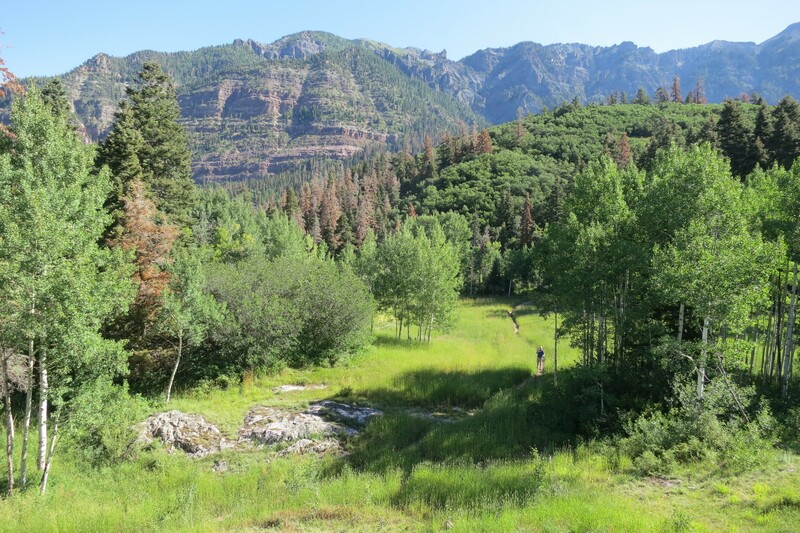 Life Rebooted – Ouray, the fun part! While we had some sleepless nights fighting the mouse war, we were finally able to get out of the RV and do some sightseeing. My friend, Debbie, came out from Virginia to visit us so we spent a few days doing the fun touristy stuff around Ouray and Silverton. The town still has a very old-fashioned feel with Main Street containing many original buildings from the late 1800s so it’s great to stroll through and enjoy the architecture. 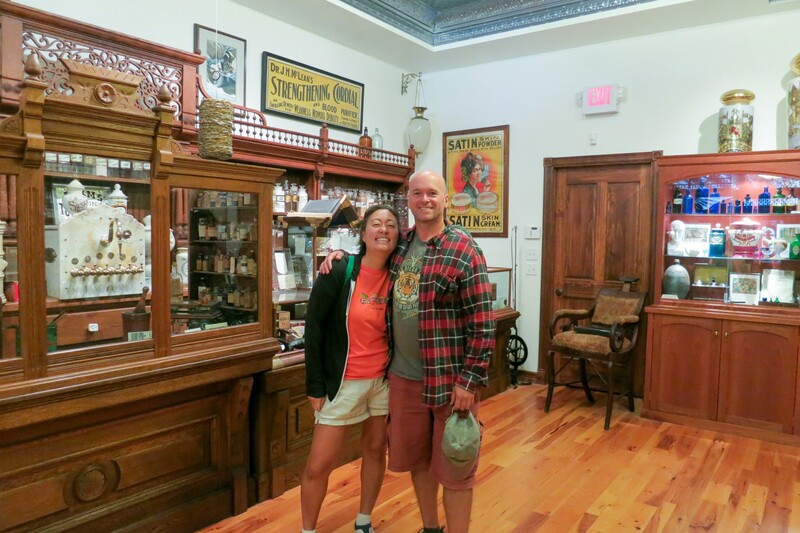 While doing research, I found the Alchemy Museum in Ouray does some fascinating tours so we decided to treat ourselves to a visit. Curt, the owner of the museum has been collecting various pharmacy paraphernalia for years. Not only does he have an amazing collection, but he provides a presentation of the history of medicine and apothecary science. His presentation is full of anecdotes and history which we found absolutely fascinating. If you have a couple of hours and enjoy history, this is a good stop to make. Then once you’re done, go across the street to Mouse’s Chocolates and enjoy a scrumptious shake or to Maggie’s Kitchen to experience one of their awesome burgers! We liked Maggie’s Kitchen so much that we ended up going four times during our stay, plus since their patio is dog-friendly we could bring Opie after our hikes to partake in the deliciousness. 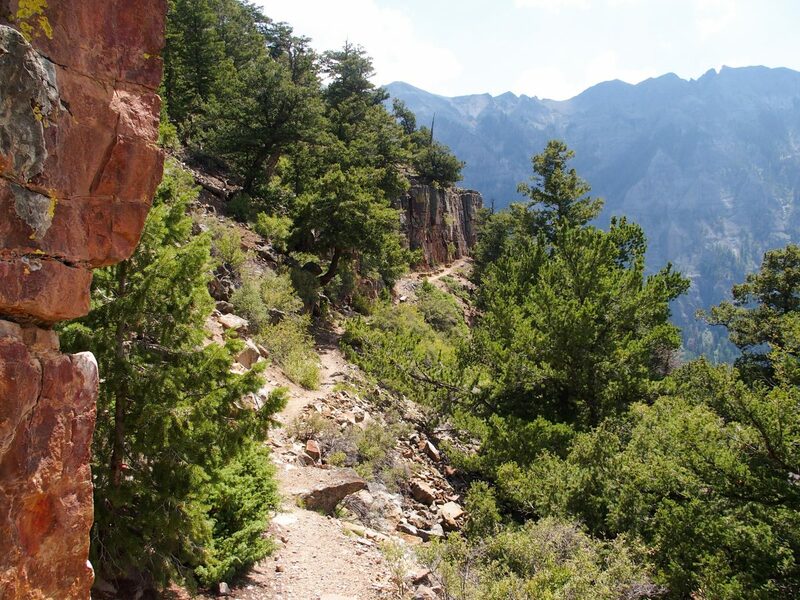 The Ouray Perimeter Trail, a 6-mile loop around Ouray comes highly rated as a hike with some fantastic scenery. 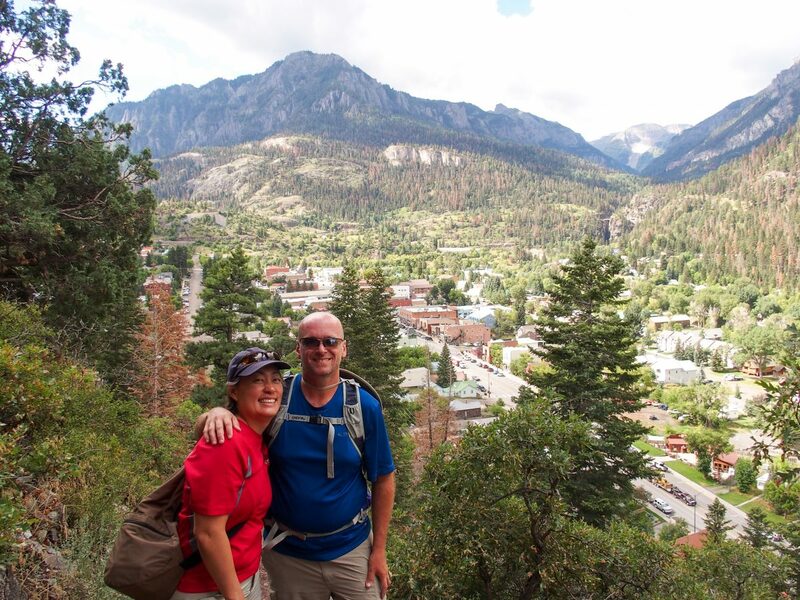 Unfortunately we didn’t think of the sudden elevation change for Debbie coming from near sea-level to Ouray at 8,000 feet elevation, and we scheduled the hike for shortly after she arrived… OOPS! We started near the Visitors Center, where the trail ascends quickly (we climbed around 800 feet in under a mile) which was tough given the altitude. 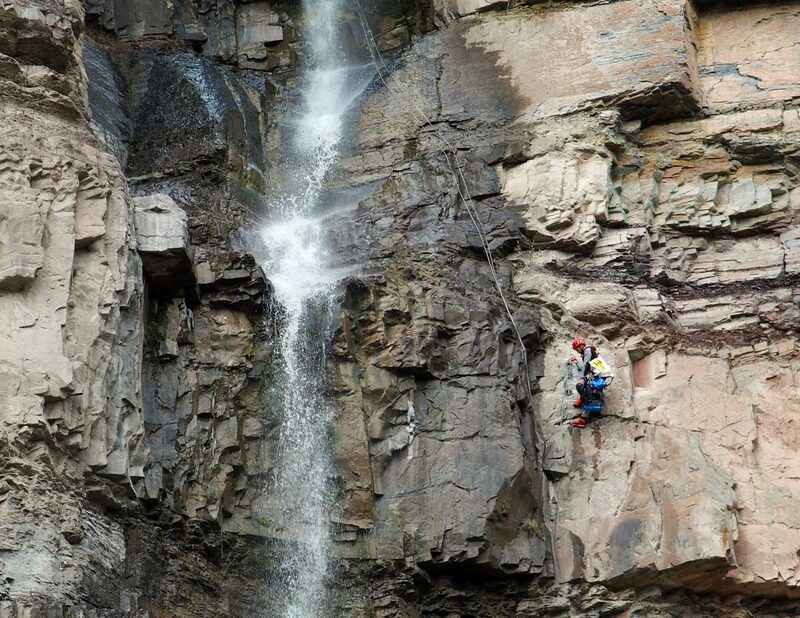 We made it to Lower Cascade Falls, a beautiful waterfall where we watched a few folks rappelling down along the falls (about 1/3 down in the photo above is a climber, zoomed in photo below), then took the trail back into town so we wouldn’t accidentally kill Debbie during her vacation! 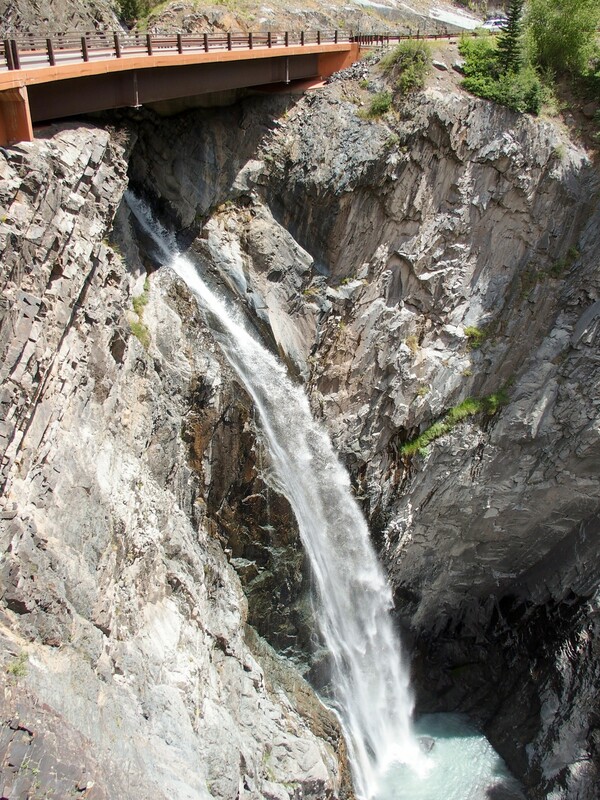 We also took a short drive over to Box Canyon Falls (entrance fee $4/adult). Here Canyon Creek narrows and plummets into a narrow slot canyon spilling thousands of gallons of water over the falls. The roar of the water as you near the falls is almost deafening and amazing. It’s an easy walk into the canyon to see the falls and a slightly more difficult walk to the high bridge which overlooks the gorge, although you can’t see the waterfall from the bridge. 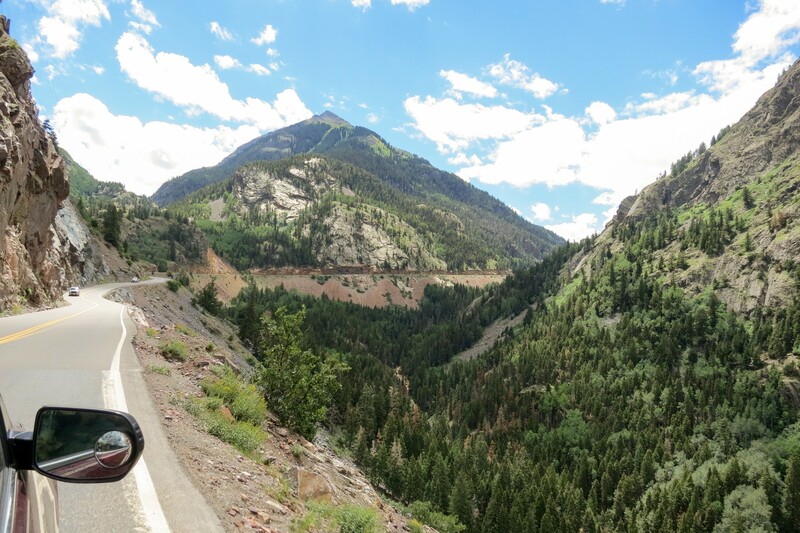 The Million Dollar Highway (Rt 550) is a stretch of highway from Ouray to Silverton known as “the most beautiful drive in Colorado” but is infamous as a difficult drive full of steep drop-offs, hair-pin turns, narrow lanes, and a serious lack of guardrails. While there are many who will drive their RVs on this road, we decided this road (and our sanity) was better suited for Red than for Rover. It’s a beautiful scenic road and definitely more enjoyable in a car. There are a lot of pull-offs where you can enjoy the mountains and scenery around you. 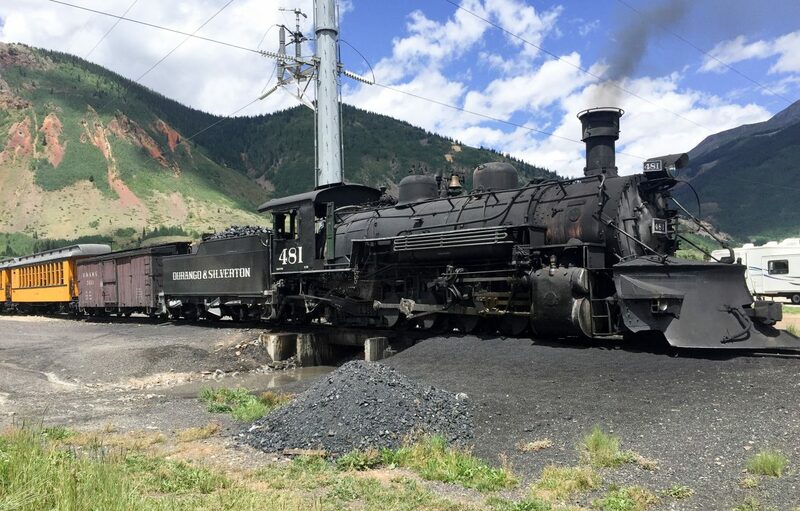 Once we made it to Silverton, we were able to see one of the Durango Silverton Narrow Gauge Trains waiting to head back to Durango. 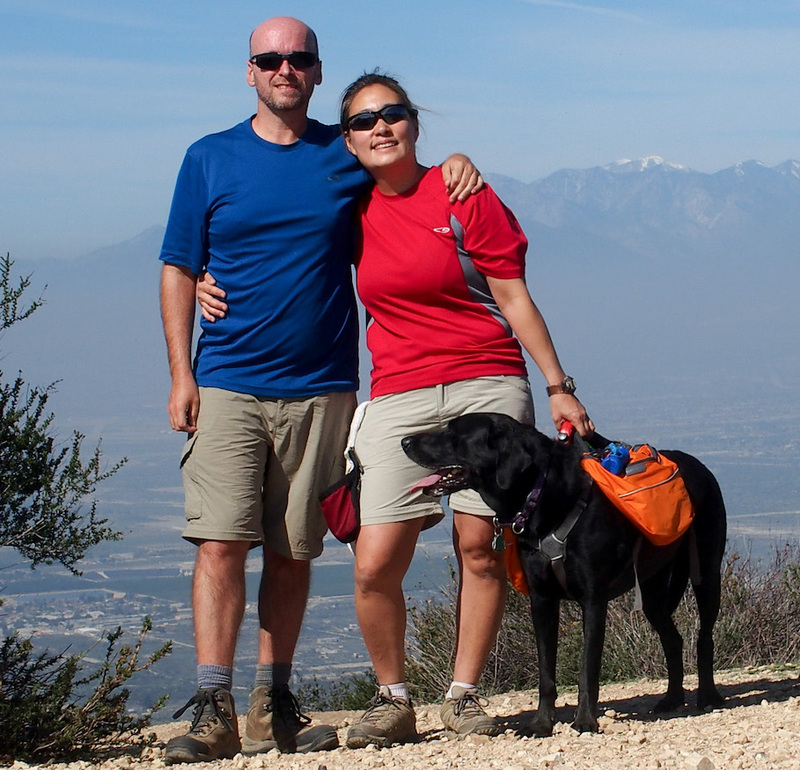 After a fond farewell to Debbie, we decided on more serious hiking, especially since Opie was getting a bit antsy from being left home for a few days while we did our sight-seeing. First we decided to finish off the Ouray Perimeter Trail which really does have some amazing views of the surrounding mountains. It has some strenuous inclines and a small tunnel (watch your head!) but the trail overall is moderate and very enjoyable. There are a few stream crossings where Opie was able to soak in the water before trekking further on. There are some wonderful views of Ouray below us while the mountains loomed above. 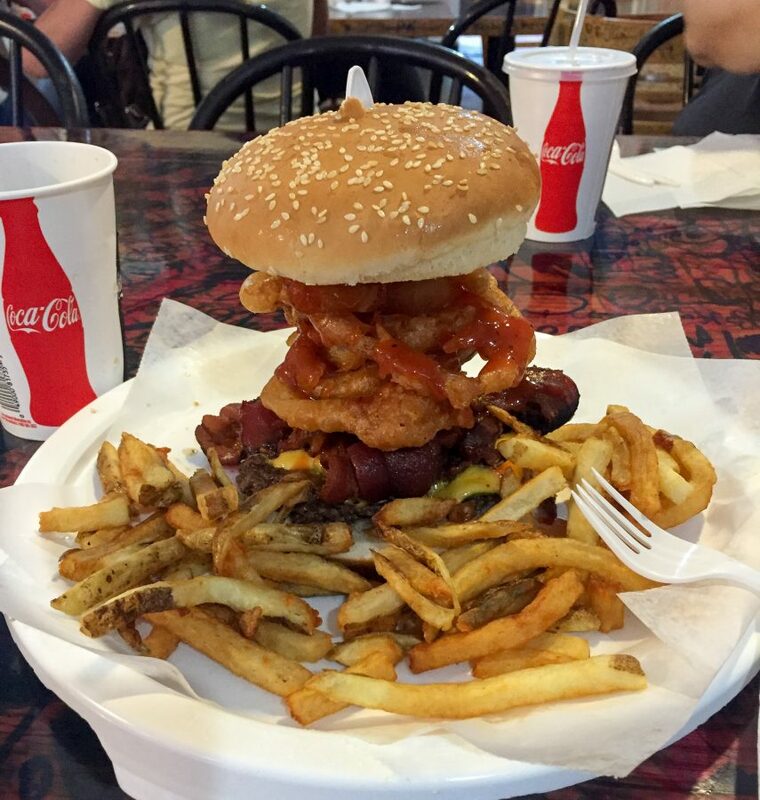 As a reward, we stopped at Maggie’s Kitchen and shared burger, fries, and a shake. Yes, Opie got some of it too. We also tackled Neosho/Sutton Mine Trail, a 4.5 mile out-and-back trail with a 2,000 foot total climb. The first half mile starts off very steep until the Ouray Overlook (photo, top of page) but then becomes much more manageable. 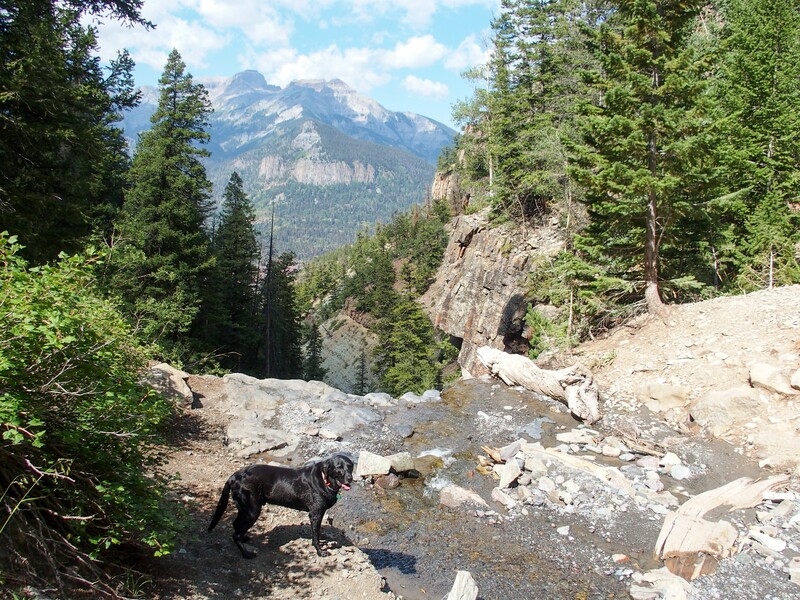 We loved this hike, you can see parts of the Million Dollar Highway as well as an amazing view of Bear Creek Falls. 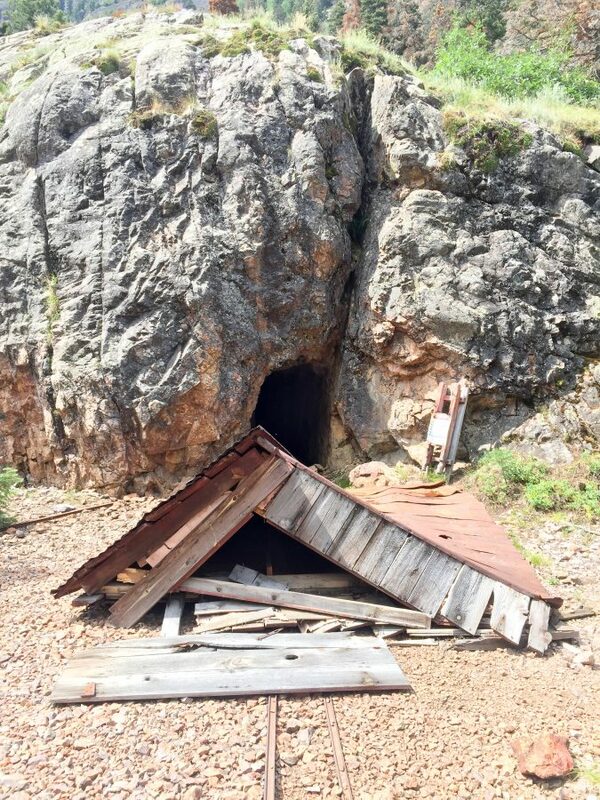 At the end of the trail, there are buildings from the Neosho mine, including an outhouse, bunkhouse, a mine car with some very rusted tracks, and the mine itself. The mine looked dark and dank so we didn’t have the courage to go in. If you can make it past the first half mile, the trail is very doable and scenic. 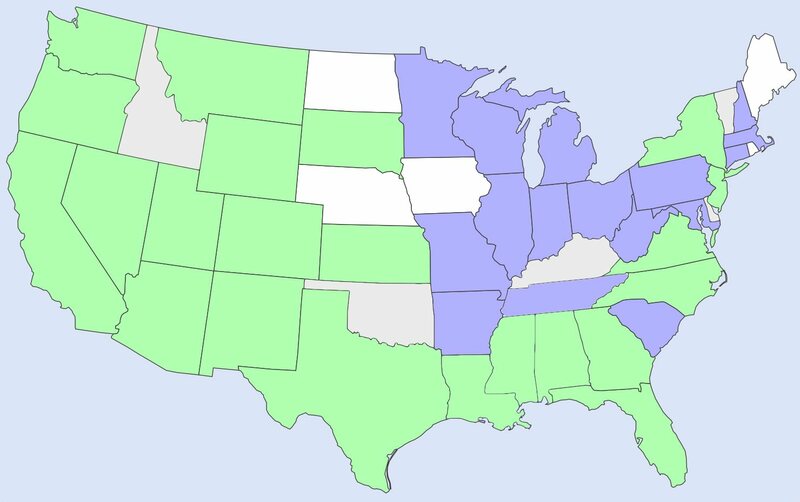 Thanks to RVillage.com (kind of a Facebook for RVers) we were notified that some other full-time RVers we’ve chatted with online for over two years were checking into our campground! We’d never met them in person, but Steve and Debbie were some of the first people to comment on our blog, and they hit the road around the same time as us in 2014. We got together in the campground a couple times, and the day after our Sutton Mine hike we hit the Upper Cascade Falls/Portland Trail with them. This is a 6.5 mile loop with a peak elevation just over 10,000 feet. This was our first 10K elevation hike but since we’ve been in Colorado for some time we were comfortable with the elevation. Unfortunately the day was pretty hazy, masking a lot of the mountains and views, but on a clear day, it must be fantastic to see! The trail crossed right over Cascades Creek with a pretty waterfall right above the trail which levels off at the trail, then plunges back down a vertical cliff after the trail. The only way to see the second waterfall is either to lay down and lean over the edge (Mike HATES it when I do that, so I did it when he wasn’t looking) or hike a little further and look behind you. 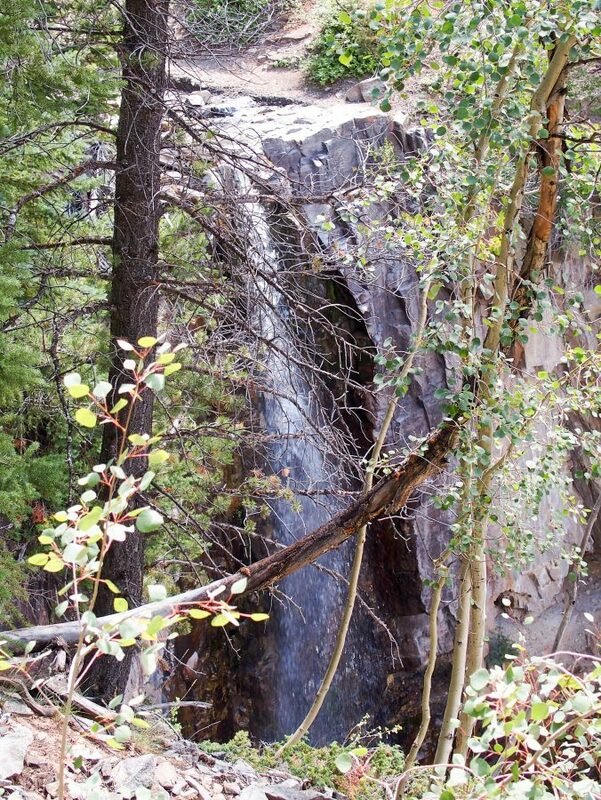 Shortly after the falls is the Chief Ouray Mine and Bunkhouse. This is where the trail got really hairy with very narrow spots and steep drop-offs. We made it to the bunkhouse which seems rather precariously perched on the edge of a cliff. Since Debbie and Steve are avid geocachers, they continued a little further along to the trail to find a cache. Since the trail narrows even further, we kept Hurley (their dog) with us while they continued forward. On the way down, we took a turn onto the Portland trail to make a nice loop back to the parking area. With three good hikes under his paw, Mike and I felt no guilt leaving Opie at home while we drove to Black Canyon of the Gunnison National Park about an hour away. 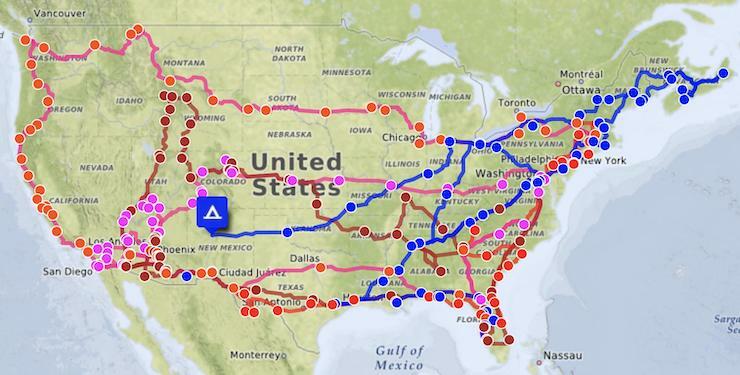 Like the Grand Canyon, you can either drive to the South or North Rim. We drove to the South entrance, right outside of Montrose, since the north would be an extra hour each way. 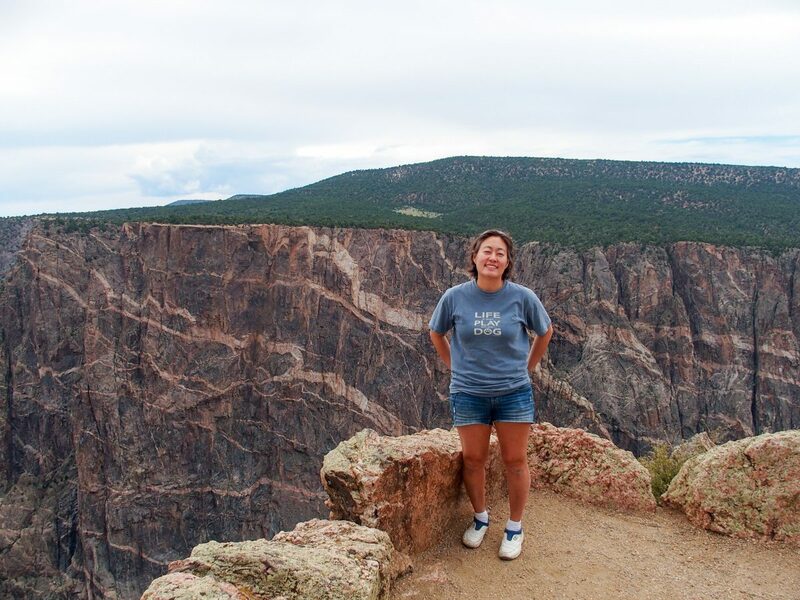 Black Canyon has some truly outstanding views! While the Grand Canyon is wide and expansive, Black Canyon is narrow, deep, and steep. It looks almost as someone (very very big) took a hammer and chisel and broke a chasm into the ground, especially since the rim is just grass and flat fields. On the rim drive, there are some areas where you cannot see the canyon and it looks like one huge empty field around you. The visitors center has a great free video of the history of Black Canyon worth watching before heading out for the scenic drive. The scenic drive is only seven miles from Tomachi Point to High Point with 12 overlooks. You do need to walk a short distance to get to the overlooks. 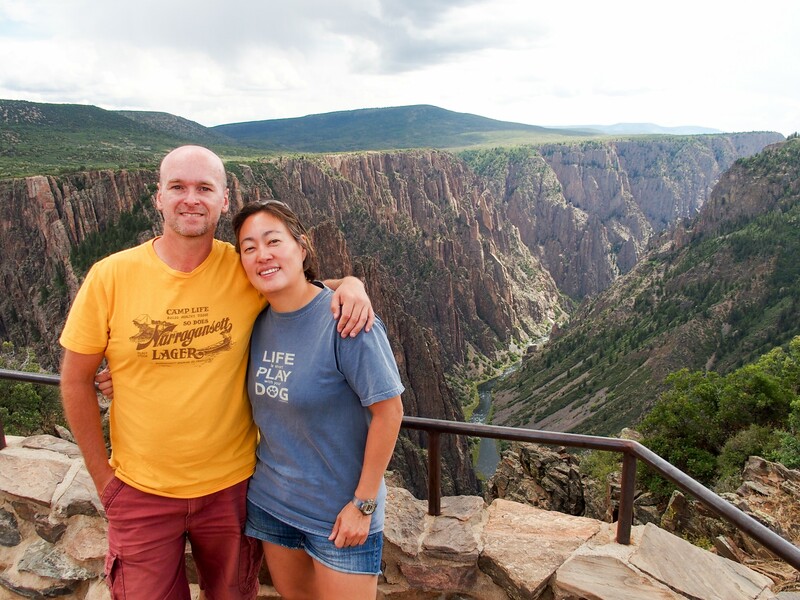 Most of the overlooks are very close to the edge with scary steep drops but awesome views of the Gunnison river below. While the Park seems pretty small and sparsely populated, it’s really worth a trip if you’re in the area. While our beginning experience at Ouray left much to be desired, the rest of the time more than made up for the mice wars, and we really loved the whole area. Enjoy our blog? You can support us by making your Amazon purchases through our Amazon affiliate link–we’ll get a small reward to use towards our fuel and other purchases. Or, check out our list of RV gear we recommend. Thanks for your support! Great pictures! 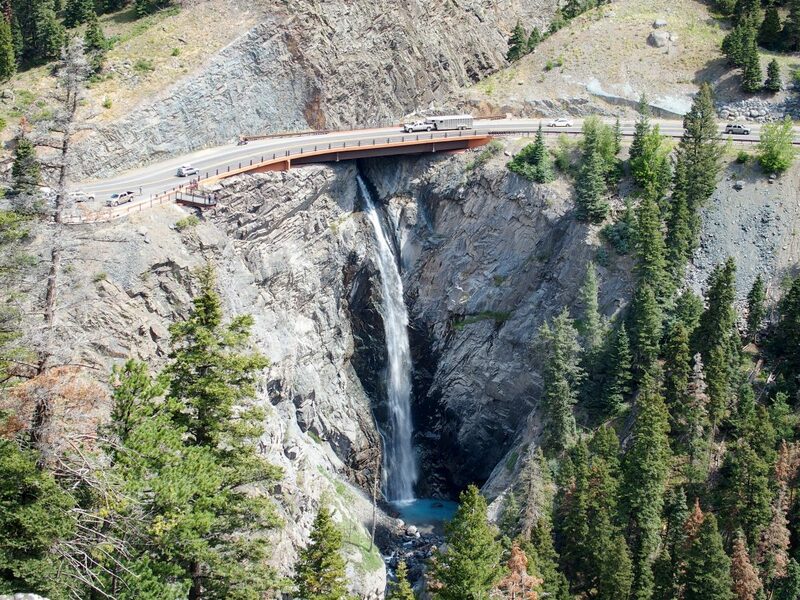 Ouray is definitely on my list of places to visit in the near future. Safe travels. Thanks! It is quite beautiful, plus it sounds like a great winter place to visit too. They have a huge hot springs area surrounded by mountains. I can’t imagine what it would be like to soak in the springs while watching the snow fall, must be pretty amazing! Hope you like it as much as we did. We would definitely go back again. Your captures of the area are excellent, and we can’t wait to go back. I went through those areas last fall while Mona Liza was attending family issues, and your post really took me back. I didn’t do any of the hikes, so your information will be helpful when we go back next fall. Great post! Excellent! I know you and Mona Liza do enjoy good hikes, and the views are outstanding on a lot of these. We only did a few while we were there and we’d love to go back to do more of them. We’d love to see photos when you go back in the Fall, especially if there is snow around! I know what you mean by elevation, we are in Breckinridge for a week at 9400ft. We have been mountain biking and the climbing is tough. We found an easy loop in the area with little elevation gain to bike and I’m still gasping to get oxygen. We will be in Colorado for the rest of the month but didn’t plan stops in Ouray or Silverton. Your post, other then the mice, added two more reasons to get back this way again to hit places we missed. Great pics, we like the 6-6.5 mile loop scenic hikes and I will save them for us to do when we come back through Colorado. Oh jeez, I’m totally there with you. I don’t think we would have the stamina to bike uphill. Just walking uphill was enough for us. 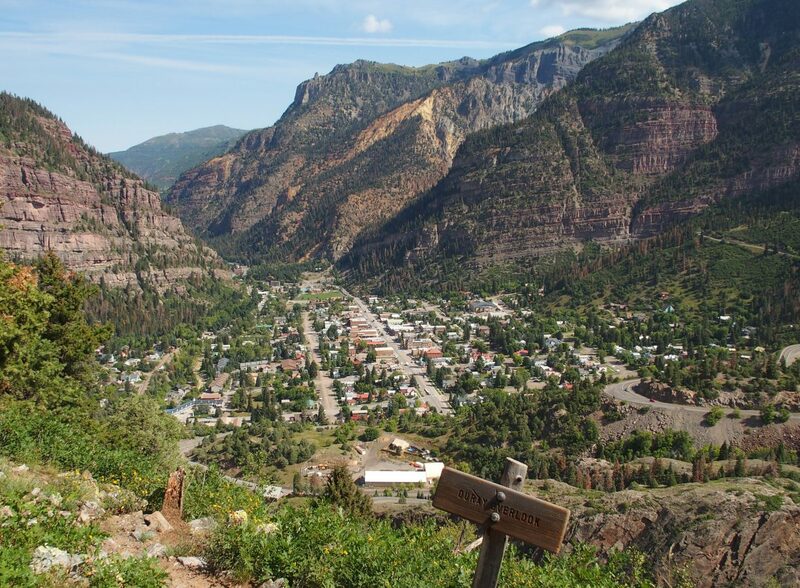 The town of Ouray is pretty but the hikes are outstanding so it sounds like it’s perfect for you. 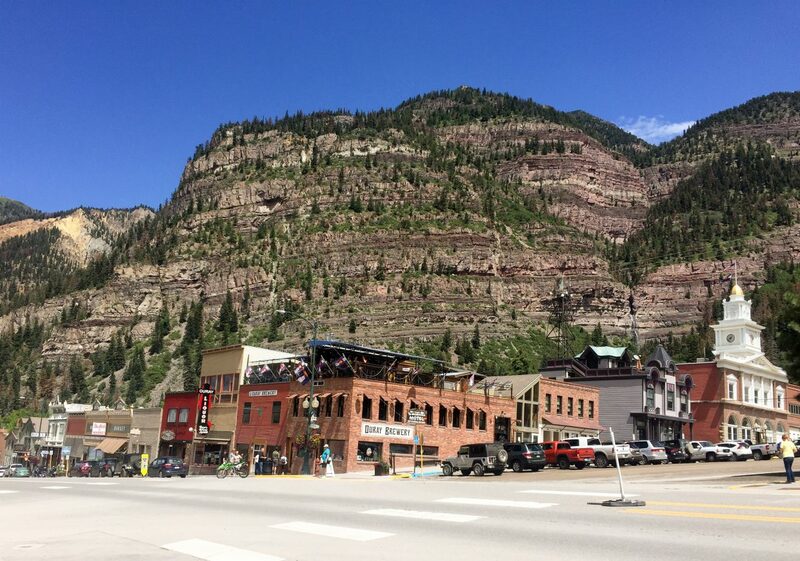 When you make it to Ouray, I’d love to read about your experiences and what you thought of it. 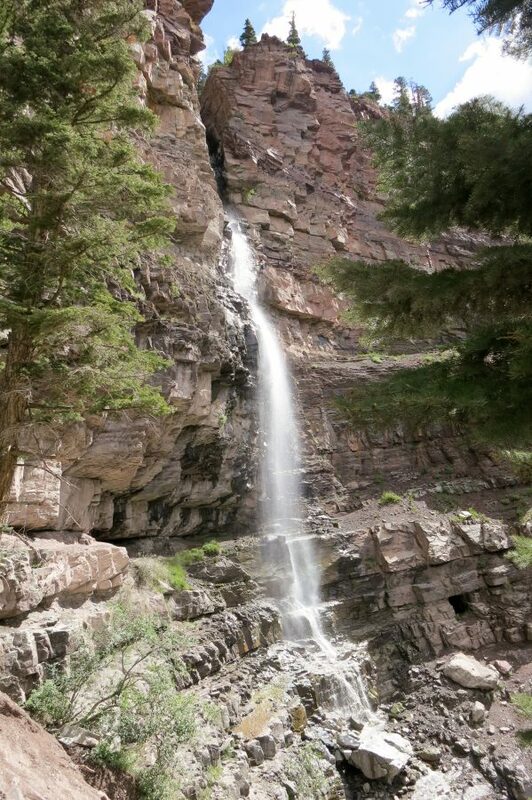 Love Colorado’s western slope and those hiking trails around Ouray are awesome. Next on my list is renting a Jeep and hitting some of those back road passes. Glad you enjoyed the area. Jeeping around Ouray sounds fun! We saw a few folks in the distance kicking up dust in their jeeps and atv’s.